Ross Murdoch completed a hat-trick of memorable victories with a 200m breaststroke personal best at the Scottish short-course nationals. Having set new Scottish records to win the 50m and 100m events, the 22-year-old from Balfron made it a clean sweep in two minutes 04.04 seconds. 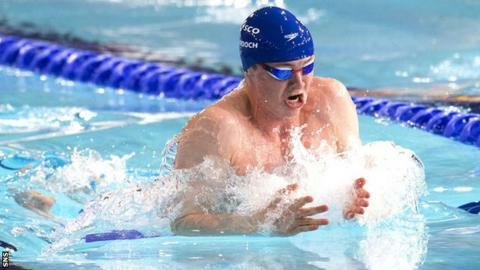 Robbie Renwick set a new Scottish records in the 100m and 200m freestyle. Stephen Milne, who won the 1500m in a Scottish record time and the 400m, was second behind Renwick in the 200m. Renwick, 27, who swam 1:43.58 over 200m, said: "I'm really chuffed with that. I'm more happy with the fact that I moved it on from this time last year, that's a good benchmark to see where I am. "It's good to be getting PBs moving into next year, that where I want to be, it's exciting." Murdoch, who won 200m gold and 100m bronze at the Glasgow Commonwealth Games in 2014, clinched Friday's 50m title in 26.69 at Edinburgh's Royal Commonwealth Pool. Saturday's success in the 100m was achieved in 57.59, with 2012 Olympic medallist Michael Jamieson finishing second in 59.60. The race was Jamieson's first since leaving his training base in Bath to relocate to Edinburgh University. Camilla Hattersley rounded off her third win of the meet on Sunday, taking first place in the 200m with a new Scottish record of 1:56.52. Meanwhile, competing at the Duel in the Pool in Indianapolis this weekend, Dan Wallace, 22, set Scottish bests in the individual medley events over 200m and 400m.